So the other day I was looking at my leftovers and came up with a new garlic free recipe that was delicious if I say so myself. It is on the healthy side as the only high fat and high calorie items are cheese and olive oil drizzle (which is a good fat in moderation). The cheese was actually a way to hide the eggplant, tomatoes, and onions from my veggie-phobic son but it made a great addition. My invention was a Grilled Eggplant Melt Sandwich. It turns out it was a hit. Even my son enjoyed it and ate most of it – onions, tomato, eggplant and all. I even unintentionally fooled my husband who thought he was actually eating bacon on his…nope, no bacon. Guess that means it was pretty good in his book. All in all, it was simple, easy, and didn’t have to go any farther than my pantry to make. I’ll be adding this one to my keep list. Slice eggplant in to approximately 1/4 inch thick slices. Salt and let sit for 1 hour to drain excess water. 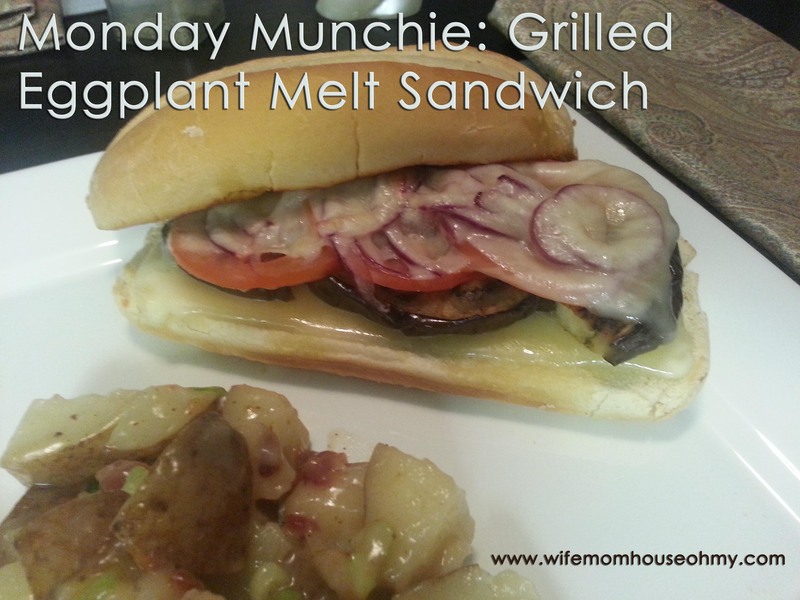 Grill the eggplant slices over a medium to medium high heat until slices are tender. You can tell they are ready when they start to take on a translucent color and sheen. Preheat oven to BROIL High. Brush Olive Oil on the inside of both halves of the steak roll. This needs to be enough to cover but not soak the roll. Working from the bottom up, layer the roll with sliced cheese, grilled eggplant, tomatoes, and onion. Sprinkle salt, ground pepper and granulated onion on top for taste. Cover with slices of cheese. (If you are doing optional bacon, layer bacon on first, then top cheese layer. Place open faced sandwich halves on a baking sheet. Place in preheated oven on middle tier. Broil until the cheese is melted on the sandwich topped half and the open face top half of the steak roll is crisped to a golden brown. Remove from oven. Place top of the roll on the sandwich topped bottom half. Slice in half and serve warm. Hope you enjoy one for yourself sometime soon! If you have invented a dish, let me know and send me the recipe. I’d love to try it and who knows, it and you may end up featured as a Monday Munchie. The next post as promised will be on pumpkin carving!! Very tasty, if I don’t say so myself, lol.